Houses along Lincoln Place in Crown Heights. This summer, I spent eight weeks as an intern in the Research Department at the New York City Landmarks Preservation Commission. The Landmarks Preservation Commission (a.k.a. the LPC), is a City agency that is responsible for designating landmarks and historic districts, and also regulates historic sites that have already been designated. The LPC designates buildings or sites that are either historically, architecturally, or culturally significant. In addition, the LPC holds public hearings to discuss and vote on proposed alterations or additions to buildings that are landmarked or within a district. The LPC’s Research Department, where I interned, is responsible for researching the historical, architectural, or cultural significance of proposed landmarks or historic districts. The Research Department also aids the LPC in questions that arise over already-designated buildings or sites. My project this summer was to work on research for the proposed Crown Heights North III Historic District. Crown Heights, a neighborhood in Brooklyn, already has two historic districts in its northern section, between Atlantic Avenue and Eastern Parkway. 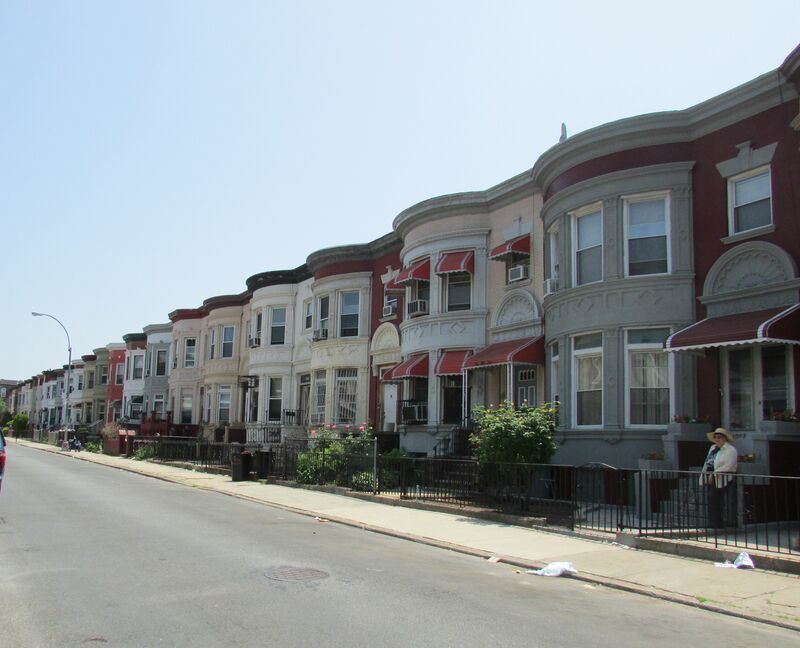 The Crown Heights North area has essentially been designated in phases because of its size and large number of historic buildings. 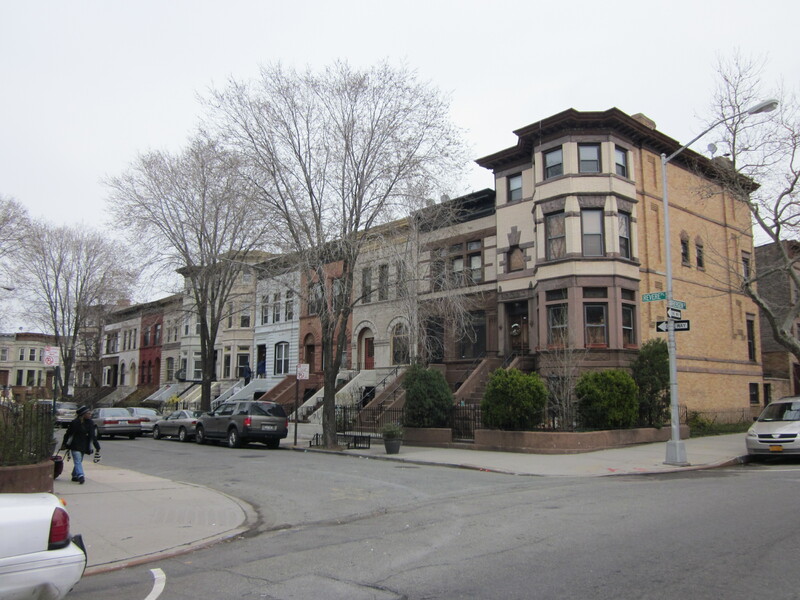 The first phase, known as the Crown Heights North Historic District, was designated in April of 2007. 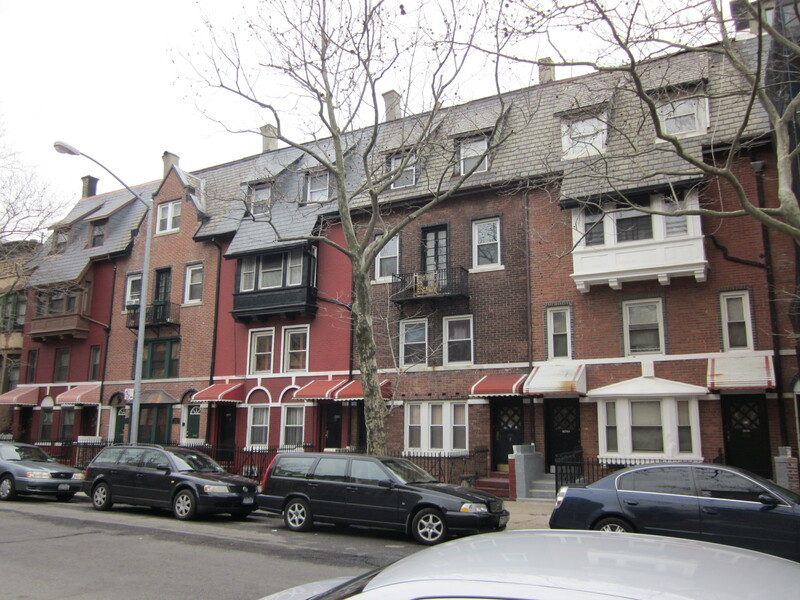 The second phase, known as the Crown Heights North II Historic District, was designated in July of 2011. The proposed Crown Heights North III district contains about 640 buildings spread over fifteen blocks. Originally rural Dutch farmland, the Crown Heights area began to grow and develop into a more residential neighborhood by the mid-nineteenth century. By the turn of the twentieth century, Crown Heights had become a desirable neighborhood for white, upper class residents. Mansions lined St. Mark’s Avenue, and desirable enclave developments on Revere, Hampton, and Virginia Places attracted well-to-do, American-born buyers. By the 1920s, blacks born in the South and the British West Indies began to slowly move into the northern parts of the neighborhood, while Polish and Russian Jewish immigrants moved into the central and lower portion of the district. By this time, the once wealthy white neighborhood had begun to morph into a more middle-class, diverse area. The majority of the proposed district’s building stock was constructed in the late nineteenth and early twentieth centuries. One part of my internship was finding construction dates, architects, owners, etc. for some of these buildings. To do this, I often traveled to the Brooklyn Department of Buildings, where I was given access to their file room that holds thousands of folders that contain building information like new building applications, alterations, and inspections. Sometimes, if I was lucky, I could even find original blueprint drawings for some of the buildings I was researching within these folders. Many buildings, though, are missing from the Department of Building’s files, so I would have to turn to other resources such as the Real Estate Record and Builder’s Guide, tax assessments, and conveyance records to try and determine a building’s date, owner, or architect. In addition to my building information research, I scanned and compiled all of the 1940s tax photos for the buildings within the proposed district. I also did this for some of the buildings in another proposed historic district, the Riverside/West End Historic District Extension II. An example of some of the “Kinko” houses. Another part of my internship was researching various aspects of the architectural, social, and cultural history of the area. One of the topics I fully divulged into was the history of the “Kinko” duplex house. Built in the proposed district between 1905 and 1912, the “Kinko” house is a two-family, four-story home that was built by the Kings and Westchester Land Company (nicknamed “Kinko” for short). These homes were unlike other two-family houses in that each house had two separate front entrances, one for each family. In addition, each family had two floors of living space – one family lived on the first two floors, and another family lived on the second two floors. Residents of the lower apartment had access to the rear yard, while residents of the upper apartment had access to a roof garden. Prior to the introduction of the “Kinko” house, residents of duplex houses had to share an entrance and common areas. With this new type of house, each family had complete privacy. One large concentration of “Kinko” duplexes, twenty-two in all, can be found on the block along Brooklyn Avenue, St. John’s Place, and Sterling Place. Originally, these houses had access to a private park in the center of the lot behind the homes, which even included its own playground and tennis court. All of these “Kinko” houses were in the district were designed by architects Mann & MacNeille. Other “Kinko” houses can be found in Park Slope and Brooklyn Heights. In addition to researching some of the housing types, I also examined both the black and Jewish histories of the neighborhood. 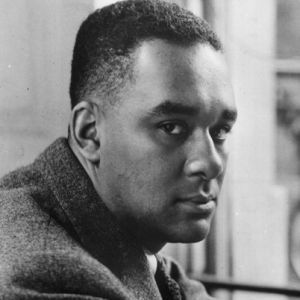 One of the most interesting things I uncovered was that famed author Richard Wright resided in the district at 11 Revere Place in 1941 and 1942. Wright, whose works include Native Son and Black Boy, lived in a small apartment with his wife, Ellen. The Wrights moved to Middagh Street after Revere Place, but their time in the district reflects the diverse, and sometimes controversial, history of the neighborhood. By the 1960s, crime and drugs were prevalent in the neighborhood, and tensions arose between blacks and Jews. 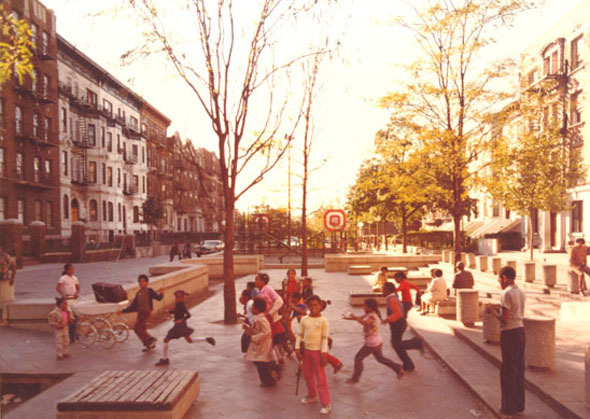 In 1968, construction began on a new “Super Block” for the neighborhood. St. Mark’s Avenue between Kingston and Albany Avenues, once a wealthy mansion-lined street, had become a place for drug trafficking, crime, and prostitution. Lead by Senator Robert Kennedy to revitalize one of the nation’s largest ghettos at the time, architect I.M. Pei and Partners closed off the street to through traffic and designed an open public plaza and playground area. Today, this Pei design no longer exists, but the street is still closed to traffic and is a symbol of the changing character of the neighborhood. Overall, I had a wonderful experience working at the LPC. Under the supervision of Director of Research Mary Beth Betts and Landmarks Preservationist Michael Caratzas, I learned a great deal about the history of Crown Heights, a neighborhood I had never been to before! It was great to see how a large city organization like the LPC works. I enjoyed having the freedom to research any topics I found interesting and important to the proposed district, and I greatly improved my research skills this summer. I recommend a visit to Crown Heights – it’s a great neighborhood with wonderful architecture and a rich past!